Andorra is a small European country between Spain and France. There are about 70,000 people living in the country. 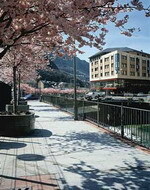 The capital is Andorra la Vella. It is ruled by a Spanish Bishop and the French President. Andorra's government is a parliamentary democracy. A beautiful mountainous country in the Pyrenees - ideal for a mountain climbing holiday or ski vacation. A modern Pyrenean hotel located in Andorra La Vella's city centre, 100 metres from a shopping mall and 6 kilometres from the ski slopes. In the Plato Restaurant fun international dishes such as cinema pizzas or art salads are served in a modern ambience decorated with movie icons and with stunning views of the river and mountains. The Gallery Restaurant also offers an international menu with panoramic views. Fitness enthusiasts can work out in the gymnasium and indulge themselves with a Scottish massage shower, or relaxation in the dry sauna or Turkish Bath. Multilingual staff can help with tourism queries and provide information on skiing. Being located in the centre of Andorra La Vella means many of its attractions within 500 metres, including bingo, the shopping mall and Andorra's Museums. Barcelona Airport is two hours and twenty minutes by car, 185 kilometres from the hotel. The Andorra Park Hotel is a modern hotel with a traditional feel set in Andorra La Vella mountains surrounded by greenery, 20 kilometres from Gran Vailira Ski Area. After breakfast guests can browse the complimentary newspapers in the lobby, head for the adjacent golf course, and go for a refreshing dip in the hotel's outdoor pool. The Hotel Restaurant Raco Del Park serves local and international dishes in an intimate setting with garden views, and guests can enjoy a snack in the cafeteria and sip cocktails in the hotel bar. Those on business will benefit from the hotel's meeting rooms and range of audio-visual equipment, and guests arriving by car will find free onsite parking. practical amenities include ski storage, a dry cleaning service and a 24-hour front desk. La Vella is one kilometre away, Vall Nord is 20 kilometres away and Barcelona Airport is 250 kilometres away..
Arinsal is a mountain resort town in La Massana parish, Andorra. 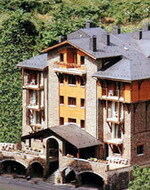 It is an all-year round mountain resort located at 1500 meters above sea level, in the north of Andorra. It is connected to the Vallnord Pal-Arinsal ski resort and is at the entrance to the Coma Pedrosa Nature Reserve. It is ideal for beginner to intermediate skiers and is popular with trekkers. The Husa Xalet Besolí is a picturesque Andorran hotel built from local wood and stone and set 500 metres from the ski gondola to the Pal-Arinsal Ski Station in Arinsal. Guests can relax over drinks in the hotel bar. In the restaurant Besolí, diners can enjoy a menu of regional cuisine, served in modern surroundings. The front desk has a safe-deposit box for storing valuables and the hotel offers storage facilities for guests' ski equipment. The hotel is within easy reach of many of the region's sights and landmarks. 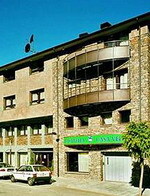 The Andorra La Vella city centre is three kilometres away. It is 23 kilometres to the Del Valira Park and 24 kilometres to both the Diocesean Museum and the Santa Maria Cathedral. Barcelona Airport is an approximate driving time of 150 minutes and a distance of 100 kilometres. 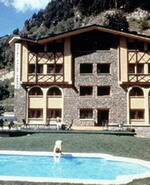 The Husa Xalet Verdú is a chalet-style hotel set 300 metres from the gondola ski lift and ten kilometres from centre of Andorra. The hotel provides ski lockers and a quiet lounge for reading and watching television in the winter months. In summer, guests take in the view from the outdoor swimming pool, which is set in a large lawned garden. Restaurant Verdú serves regional dishes in the rustic dining room, with terracotta tiled floors and red tablecloths. Barcelona Airport is 250 kilometres from the hotel. View map of Ordino Ordino is the most northerly parish in the Principality of Andorra. 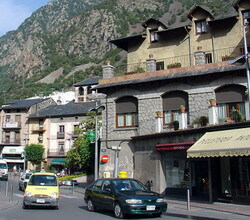 Ordino is also the name of the main town of the parish. The main other settlements are El Serrat, Ansalonga, Sornàs, La Cortinada, Llorts, Segudet, and Arans. It is home to the Sorteny National Park. It has a population of 3,066, as of 2005. The 12th century Romanesque Sant Corneli and Sant Cebrià church and belltower in Ordino. The modern apartments of the Aparthotel Casa Vella are set in the centre of Ordino, 20 kilometres from the slopes and ski lifts of the Ordino Arcalis Ski Area. Guests can start the morning with a buffet breakfast at the hotel before a day on the slopes. The Ordino Arcalis Ski Area offers 1100 acres of ski slopes for skiers of all levels of experience and 14 ski lifts. 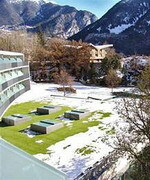 The hotel offers storage facilities for ski equipment and guests can relax in the evening with drinks in the hotel bar. Those keen to explore the area can find the country's capital, Andorra La Vella, with its restaurants and medieval architecture ten kilometres away. The nearest major airport is Barcelona at distance of 200 kilometres from the hotel.